My mum used to say that she should travel to the Sahara, where she would be welcomed as a great witch doctor, as she brought rain wherever she went. I seem to have inherited this great gift, as I brought rain to the driest place in the world. That’s some powerful witchcraft. 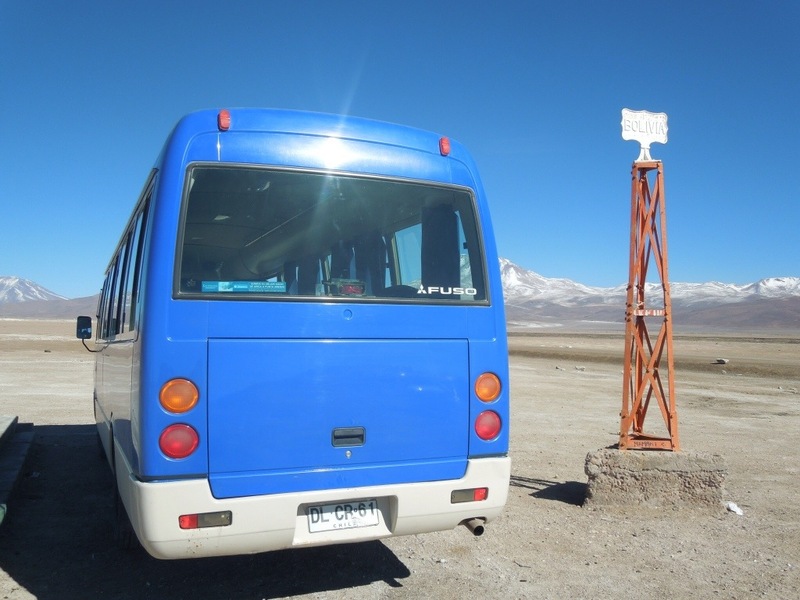 The Salar de Uyuni tour had ended at the Chilean border, where for the first time they actually checked our luggage in customs, and the Bulgarian couple on our bus had to leave behind two apples. I also had a pretty special experience of going to the toilet in no man’s land, peeing behind a shed between the two countries. (Too much info?) 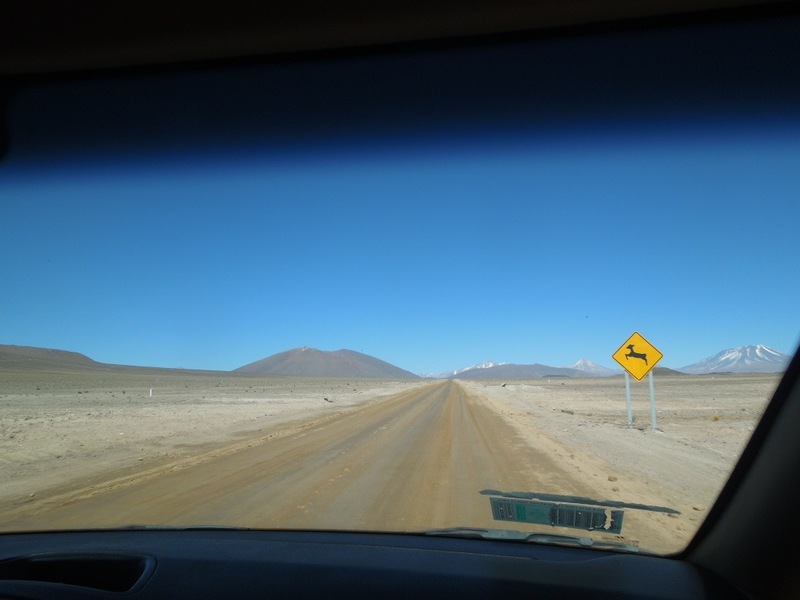 We were picked up by a bus and drove on into Chile, where the landscape continued in much the same vein: they have salt flats, too, though they don’t seem to advertise it as much as Bolivia. Here, they mine borax, which is used, we were told, to make things like windows, water bottles… and chloroform. Hmm. 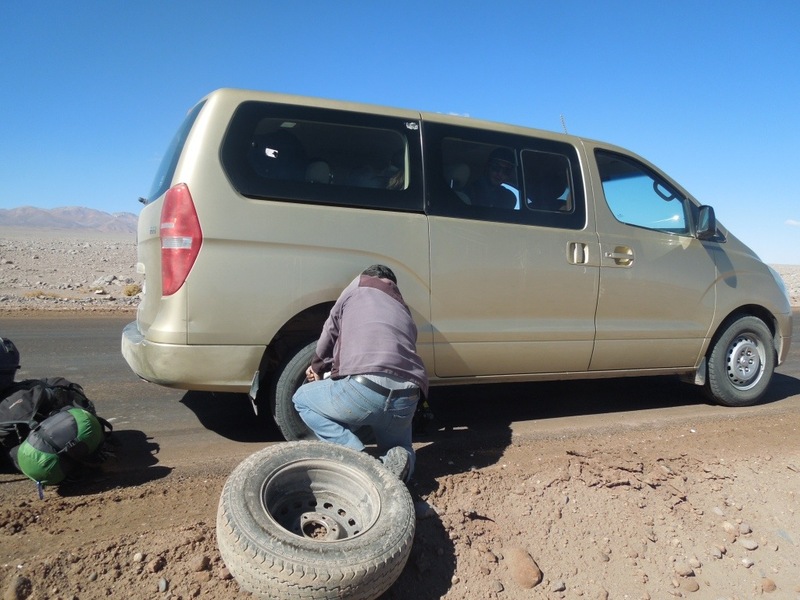 Then suddenly we stopped: a flat tire. Another bus stopped behind us and the driver very kindly helped to replace the tire, after which he went on his merry way. A few seconds later, our driver discovered that the second tire was flat. At this point, I had another interesting toilet experience: peeing outside the car in a pretty much completely flat and open landscape (“Don’t turn around, please”), with a very strong, gusty wind. (Sorry, I did it again.) 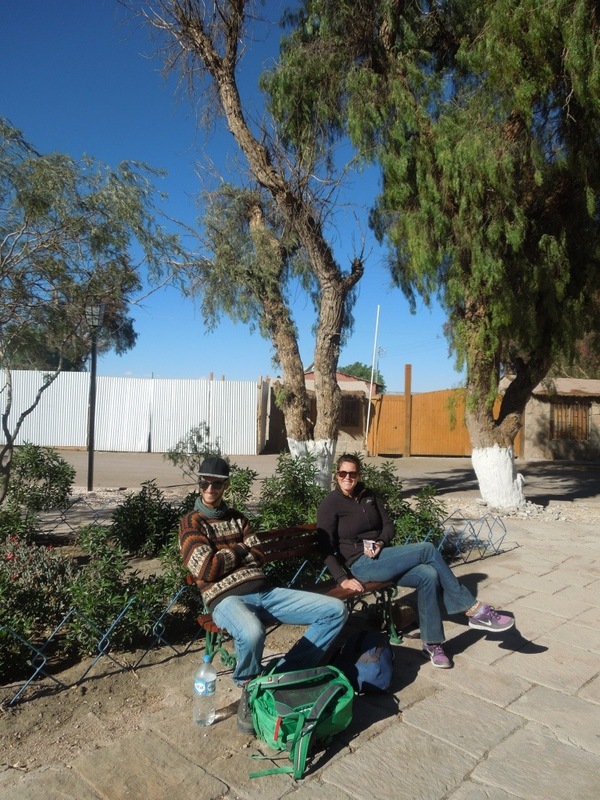 But we were saved once more, as another tour agency bus came by and said they could take us direct to our destination, San Pedro de Atacama. Ten minutes later, the new driver stopped and went off to a restaurant with his group. We had already stuffed ourselves with biscuits and nuts on the bus as we’d been told there would be no lunch stop, so we waited in the park. “Media hora.” They came back an hour later. Then we drove to the airport to drop some people off. 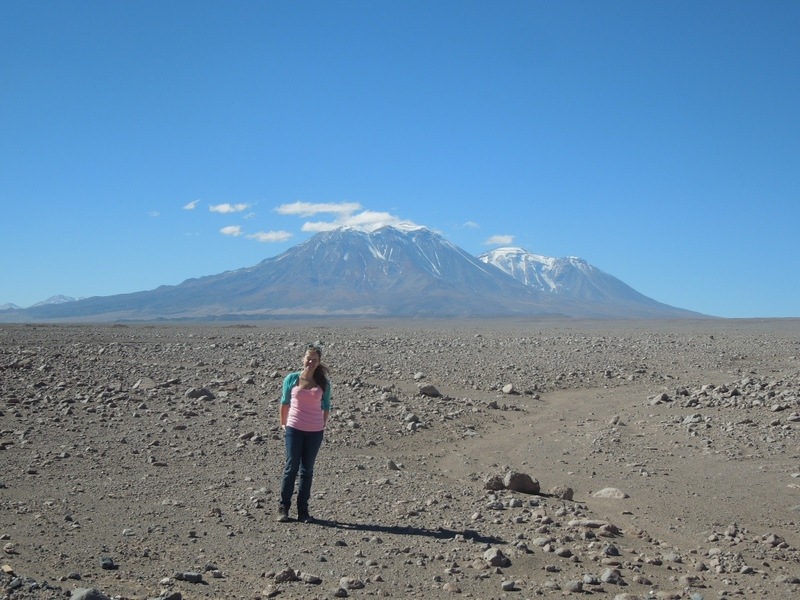 But eventually we did, in fact, arrive in San Pedro, having driven through a lunar landscape of nothingness to arrive at the foot of the volcano Licancabur. I was still with Jen the “just smiled and gave me a Vegemite sandwich” Australian and Hugo the “my behind-work hurts” Dutchman from the salt flat tour, and we collapsed into a nearby hostel and shortly thereafter went out for dinner. The stress of the journey had obviously taken its toll, as we went out in search of chocolate brownies, which we found, along with a few chocolate martinis (me) and whiskeys (Jen). Poor Hugo must have suffered in our company even more at this stage, as he only had a couple of beers. The next day was a day of rest. After a lie-in, I wandered the streets, browsing the shops and artisan stalls. And then it started to rain. In the driest place in the world, in case you’d forgotten. I happened to be walking past the archeological museum so I popped in to a look. The museum was founded by a Belgian, Gustave Le Paige, a Jesuit who arrived in 1955 to take over the parish. The mummies that had previously constituted the highlight of the museum have unfortunately been moved to a more protected place for preservation, so what was left was an okay exhibition of plants, textiles, and ceramics from the region. Most interesting I found the ornate tablets for inhaling hallucinogens. In town, I bumped into the Bulgarian couple from our tour. They had been most upset to have been forced to pay for a visa on entering Bolivia, despite Bulgaria being part of the EU since 2007. “We were treated the same as someone from Burkina Faso!” they announced in indignation. At one point in the car, they had screamed for the car to stop, as if their life was in danger. They had spotted an ostrich. (Well, it’s called a nandú.) So we had to drive back to see it. In San Pedro, they immediately signed on to a morning tour to see the geysers (“smaller than we had thought”), an afternoon tour to see the Moon Valley (basically the landscape that we had seen on entering the town), and another full-day tour to the Chilean salt flats (after our three-day tour of the Bolivian salt flats). I was exhausted just thinking about it all. 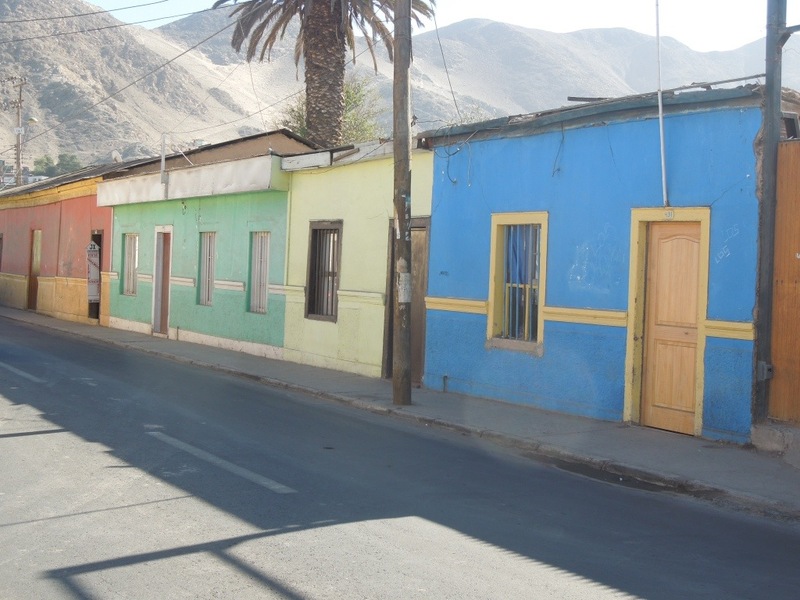 My next stop was Copiapó (on a day bus which nonetheless had me surrounded by eleven snoring men the entire journey), internationally known as the site of the mining rescue of 2010. The Lonely Planet guided me to the “unmissable” Museo Mineralógico which, I can assure you, is very much missable. It’s not so much a museum as a big room full of rocks. That said, I became more and more fascinated as I went around examining the displays, and impressed by the wonder of nature to produce such a range of colours, structures, and brilliance. At the end, they even had a meteorite and a cupboard with glow-in-the-dark stones. 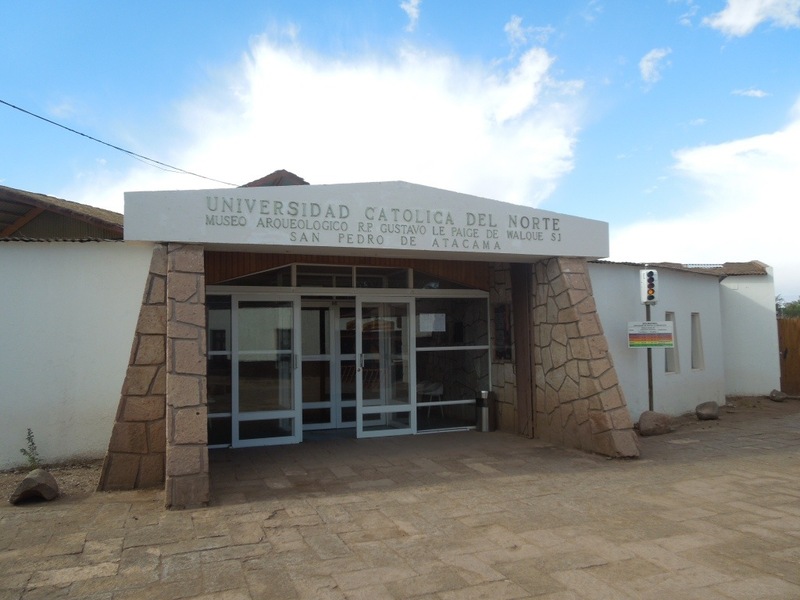 So I wouldn’t go out of my way to come here if I were you, but if you happen to be in Copiapó, it’s worth a short visit. After just one night, I booked onto a bus to continue on my journey south, arriving at the bus terminal with minutes to spare (having had to run back to pick up my amazing-yet-squashed Panama hat that I had dropped along the way), and then waited an hour for the bus to actually turn up. 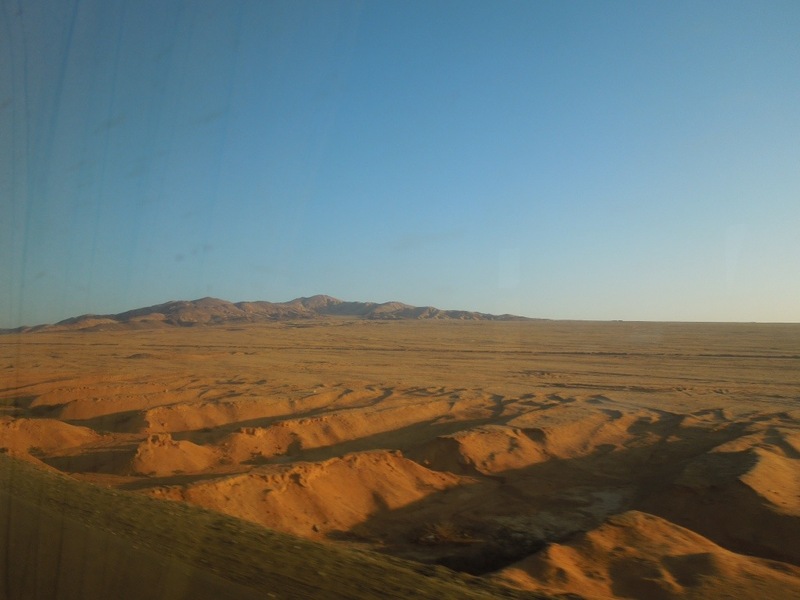 In the evening, I arrived in La Serena.